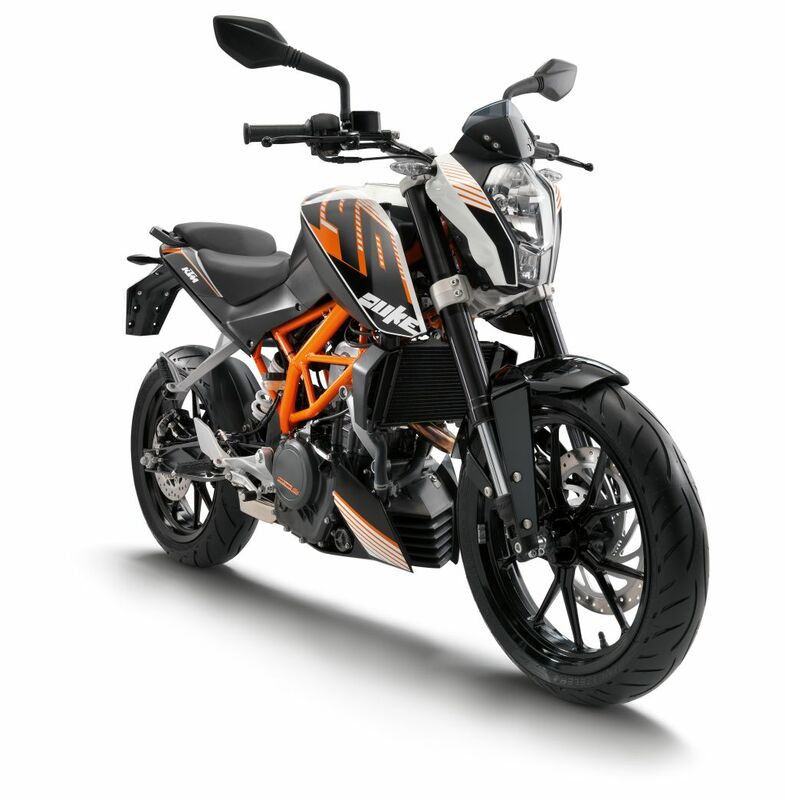 The much-awaited KTM 390 Duke can be yours now for Rs. 1,80,000 (ex-showroom, Delhi). Bajaj Auto and KTM launched the attractive streetbike today and is expecting a good response from the Indian market. The 390 Duke is aggressively styled with minimalistic body work and an exposed bright orange trellis frame, giving it a very typical KTM look and feel. The 390 Duke is powered by a four-stroke, single cylinder, 373.2cc engine putting out maximum power of 43bhp at 9500 rpm and peak torque of 3.57kgm at 7250 rpm. The engine is fuel-injected, liquid-cooled and operates using a quartet of valves driven by a twin camshaft. This big Duke gets a six-speed gearbox that shifts in a one-down five-up pattern. In India, the 390 Duke will be sold with a larger radiator. The bike is equipped with illuminated switchgear, dimpled palm grips, a comfortable set of levers and good mirrors. The compact but comprehensive digital instruments show speed, fuel level, an odometer, trip meters and a tachometer. The 10.2-litre fuel tank offers deeply recessed, appropriate thigh support. A side stand-down warning light is standard. Overall build quality, fit and finish is expectedly great. The 390 Duke deploys a rigid, steel trellis frame and chunky 43mm diameter front upside down forks developed by suspension specialist WP, and at rear a cast alloy swingarm supporting a monoshock. The suspension setup will be slightly tweaked on the Indian spec bike making it more suitable to harsh Indian road conditions. The 390 Duke uses an ABS enabled 300mm single disc brake in front and 230mm unit at rear, a radial mounted, four piston caliper biting the front, and both controlled by steel-braided hydraulic lines. The bike rides on tubeless Metzeler radial tyres and will be sold through Bajaj’s existing network of 75 Probiking dealers.